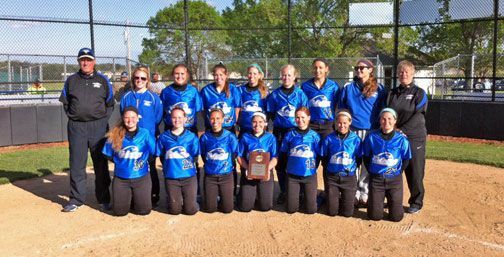 Photo of East Central College's District J Softball Champions is courtesy of Craig Monzyk. Union, Mo. - The East Central Lady Falcons (32-20) knocked off Murray State in this afternoon’s District J series to advance to the NJCAA Division II National Softball Tournament in Clinton, MS, May 14-17. In a best three game series, ECC won the first game 2-1 and completed the sweep by holding off the Lady Aggies ,4-3, in the second game to return to Nationals for the second time in three years with their last appearance being 2012.